The San Francisco 49ers, fresh off an opening week victory to start the 1980 NFL season, hosted the St. Louis Cardinals on September 14 in Week 2. The 49ers were coming off consecutive 2-14 records in 1978 and ’79 and were in their second season under Head Coach Bill Walsh. 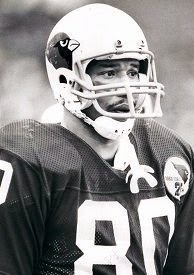 QB Steve DeBerg had set league records for pass attempts and completions in Walsh’s innovative system and had a fine, if injury-prone, HB Paul Hofer (pictured above) to hand off and pass to as well as rookie FB Earl Cooper. DeBerg’s passing statistics were heavily skewed by his tendency to dump off short passes to his backs rather than throw downfield and, in the Week 1 win over the Saints, 17 of DeBerg’s 21 completions were to Hofer and Cooper. The Cardinals had been 5-11 in 1979 and surrendered 41 points in losing to the Giants in their opener. Jim Hanifan was the new head coach but 36-year-old QB Jim Hart had been a familiar face in St. Louis since first taking over the starting job in 1967. RB Ottis Anderson was outstanding as a rookie in ’79, rushing for 1605 yards, and WR Pat Tilley a quality possession receiver. The defense was a work in progress and had most notably added rookie DE Curtis Greer, the team’s first draft choice. There were 49,999 fans in attendance at Candlestick Park. Starting off at their 45 after a 37-yard return of the opening kickoff by DB Roy Green, the Cardinals drove to the San Francisco 17. Jim Hart completed three passes, including one to WR Mark Bell for 15 yards in a third-and-14 situation, but they came up empty when Steve Little’s 35-yard field goal attempt was wide to the right. St. Louis got the ball back a few plays later when CB Tim Collier intercepted a bomb by Steve DeBerg at the goal line. Hart completed consecutive passes to TE Doug Marsh that totaled 42 yards, but after again advancing into San Francisco territory, the Cards were forced to punt. Neither team could reach scoring territory until the 49ers put together a six-play, 56-yard series in the second quarter. DeBerg, who was suffering from laryngitis and using an electronic voice amplifier so his teammates could hear him, completed two passes to Earl Cooper, the longest covering 19 yards, and the drive was capped by a throw to Paul Hofer for a 19-yard touchdown. Ray Wersching added the extra point to make the score 7-0. On the Cards’ next play from scrimmage, Marsh fumbled after catching a pass and LB Bobby Leopold recovered for the 49ers, who returned it to the St. Louis 22. But the home team was unable to capitalize, having to settle for a Wersching field goal try from 34 yards that was partially blocked and missed the mark. The teams traded punts thereafter for the remainder of the half. St. Louis got a break on the second half kickoff when WR Terry Anderson fumbled and FS Ken Stone recovered for the Cards at the San Francisco 22. Seven plays later, Hart threw to FB Theotis Brown for a 13-yard touchdown and, adding on Little’s extra point, the score was tied at 7-7. The 49ers punted following a short series and the Cards drove to another score, this time taking 13 plays to cover 67 yards. Hart passed to Anderson for 17 yards on a third-and-five play, one of six completions along the way, with the last to Marsh for a five-yard touchdown. Little added the PAT and the visitors were ahead by 14-7. San Francisco was on the move as the period came to a close. DeBerg tossed a pass to Hofer for a 23-yard gain and HB Lenvil Elliott ran around end for 19 yards to the St. Louis 22. On the second play of the fourth quarter, DeBerg connected with Cooper for a nine-yard TD and Wersching’s extra point again tied the score. Now it was the Cards suffering a turnover on a kickoff, as HB Randy Love coughed up the ball when hit by LB Dan Bunz and DB Charles Cornelius recovered at the St. Louis 26. But the opportunity was missed when DeBerg threw for the goal line four plays later and was picked off by CB Roger Wehrli, who returned it 25 yards. The visitors made the most of the reprieve, advancing 75 yards in eight plays as Hart completed passes to WR Mel Gray for 29 yards and to Pat Tilley for 18. HB Willard Harrell ran for a five-yard touchdown that, adding Little’s conversion, put the Cards back in front at 21-14. The 49ers fought back, with Cofer catching two straight passes from DeBerg, the second for 27 yards to the San Francisco 48. However, penalties set them back and then DeBerg again tossed an interception, this time by SS Ken Greene, who ran it back 26 yards to give St. Louis excellent field position at the San Francisco 25. Faced with the prospect of falling behind even farther, the 49ers toughened on defense. Harrell was thrown for a two-yard loss and then lost another seven yards after catching a pass and being hit by LB Willie Harper. The teams exchanged punts until San Francisco, getting the ball back with 1:51 remaining in regulation, put together an 80-yard drive in eight plays. DeBerg completed five passes, the longest to WR Dwight Clark for 16 yards in a do-or-die, fourth-and-eight situation, and Hofer ran for a 26-yard touchdown. Wersching added the all-important extra point, and the game went into overtime tied at 21-21. The Cardinals had the first possession in the extra period but went three-and-out and punted. Starting at their 32, the 49ers gained 15 yards on a DeBerg completion to Hofer and, following a short gain by Cooper, DeBerg threw to TE Eason Ransom for nine yards to advance into St. Louis territory at the 43. 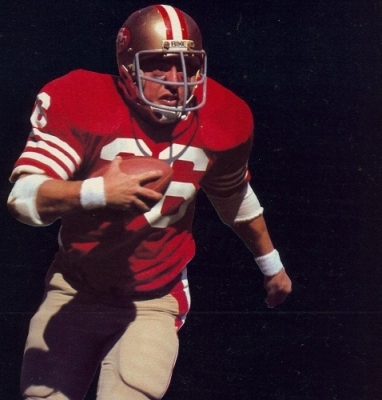 Hofer took off for an 18-yard run to get into scoring range and, four plays later and at 2:25 into overtime, Wersching kicked a 33-yard field goal to win the game for the 49ers by a score of 24-21. San Francisco had the edge in total yards (392 to 342) although the Cardinals generated more first downs (21 to 19). St. Louis was held to 86 yards on 36 running plays, while gaining 256 net passing yards, while the 49ers had 132 yards on the ground and 260 through the air. Both teams turned the ball over four times apiece. Paul Hofer had an outstanding all-purpose day, rushing for 89 yards and a touchdown on 14 carries and catching 9 passes for 135 yards and another TD, a total of 224 yards from scrimmage. Steve DeBerg completed 25 of 42 throws for 266 yards and two touchdowns, but also gave up three interceptions, and as usual only five completions were to wide receivers. Earl Cooper also had 9 pass receptions, for 51 yards and a score, while running for 13 yards in 8 attempts. For the Cardinals, Jim Hart completed 28 of 38 passes for 265 yards and two TDs while being picked off once. Doug Marsh (pictured at right) topped the receivers with 7 catches for 90 yards and a touchdown. Ottis Anderson, who was knocked out of the game in the fourth quarter, was held to 59 yards on 20 carries. With two wins in the first two games, the 49ers equaled their total of the previous season, and they reached 3-0 before losing eight straight games. They rallied to finish at 6-10 for third place in the NFC West, and by that point Steve DeBerg had been supplanted by second-year QB Joe Montana. The stage was nearly set for Bill Walsh’s rebuilding project to yield a NFL title in 1981. The Cardinals reached 0-3 before winning their next two games, but, with the defense beset by injuries, they ended up at 5-11 and fourth in the NFC East. Hofer continued to be productive until a knee injury ended his season in the sixth week. He rushed for 293 yards, averaging 4.9 yards per carry, and had 41 catches for 467 yards (11.3 avg.) and totaled three touchdowns. Hofer returned for 1981, but would be placed on injured reserve long before the postseason run in what was the final year of his promising but injury-filled career. Earl Cooper led the 49ers in both rushing and pass receiving as a rookie, gaining 720 yards on the ground and catching 83 passes for 567 yards (6.8 avg. ).